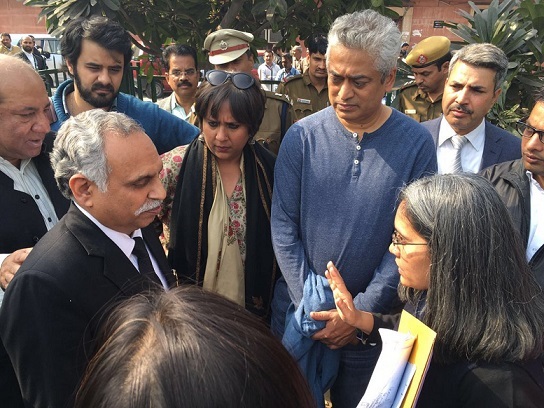 Did Students and Journos Abuse Lawyers, Instigate Violence During JNU Case Court Hearing? Our national media, and especially the English language media, is up in arms over an altercation involving journalists, JNU students, and lawyers at the Patiala High Court complex in New Delhi on 15 Feb.
“Men wearing lawyers’ robes snatched reporters’ phones and notebooks and pushed them to the ground, accusing them of being “pro-Pakistan” and “anti-Indian”. It is interesting to note the newspaper giving credence to claims on social media as it allows for blame-shifting on the media’s favorite punching bag – ‘right-wing Hindu nationalists’. Normally, opinions on social media are dismissed as rantings of the cow worshipping ‘Internet Hindu’ with poor English grammar. However, in its rage over this unfortunate incident where some journalists were indeed attacked, the national media is resorting to selective reporting. Not surprisingly, the class bias of most in the national media (a phenomenon more entrenched in the English language journalist) comes across in the way this scuffle in Patiala High Court complex has taken prominence over the spate of murders of journalists in UP – a state right next door to Delhi. There have been no protest marches taken out by Delhi based journalists over the dire situation facing their poor country cousins in UP, or when Shirin Dalvi, a Muslim woman editor had to go into hiding, wear a burqa and battle four FIRs for the ‘crime’ of daring to publish Charlie Hebdo cartoons. But new facts have emerged in social media about what actually transpired in Patiala High Court. They provide a more balanced view of what actually happened. None of the parties involved : journalists, JNU students, lawyers and police come out of this sorry episode with their reputation enhanced. What follows is based on a first-hand account narrated in a series of tweets by Kabir Singh Nihang, a lawyer & researcher primarily engaged in matters appearing in Supreme Court of India & High Court of Delhi. 5-7 students from JNU (supporters of arrested JNUSU President Kanhaiya Kumar) and a couple of reporters got into a heated argument with lawyers, and 2-3 advocates were called “Modi ke D***e” (Modi’s pimps). Incidentally, the same abuses were used at a ‘protest’ outside RSS office in New Delhi a few days back. One lawyer was beaten up by the students & reporters. This news spread to the canteen and union office, and people who were already ticked off by “bharat ki barbaadi tak” (Bharat should be destroyed) chants, got further agitated. The entire situation quickly degenerated into mob violence, and some innocent reporters also got caught up in the ensuing melee. The few police stationed in the court complex were outnumbered to deal with the situation which quickly went out of hand. Another advocate has also confirmed the above sequence of events. While it can be no one’s case that such assaults on mediapersons, for whatever reason, should be condoned, the media needs to introspect on why it evokes so little empathy from the common public today. Why has the journalism profession acquired such negative connotations like ‘paid’, ‘crooks’, ‘biased’? Could one of the reasons for this fall in public opinion of mainstream media, be the abysmally low standards set by leading media personalities like Rajdeep Sardesai and Barkha Dutt who’s ideological leanings have colored their reporting of events time and again. Sardesai’s crowd–baiting and thuggish brawling outside Madison Square Garden in New York comes to mind. Are ordinary Muslims being instigated to level fake allegations to mar Yogi Administration?